● Contact us through our toll-free number (855) 202-1010 or email us through our contact form. ● We will schedule your visit at your convenient time (we know you may be working during business hours) – weekends, after-hours – whatever time suits you. We will schedule a time when you can be present and with our team during the entire process. ● State any additional items you’d like to give special attention and record in greater detail other than the virtual tour of the house, such as jewelry, musical instruments, oil paintings, products with serial numbers, etc. – these can be individually photographed and embedded in a special section of the virtual tour. ● Our Virtual Tour team will shoot the 360° images throughout your house and any additional photos desired. The shooting could take between 30 minutes to a couple hours, depending on the size of the property and the amount of detail needed to be captured. ● Payment will be made during our visit using credit card, cash, or check. We will provide you with your MaxRecover instructions, special information about the service, and your contract. ● Our programming team will develop the actual Virtual Tour, embed any additional important information, securely store in our local and cloud servers, and mail your copy of the MaxRecover Virtual Tour in 5 to 7 days. 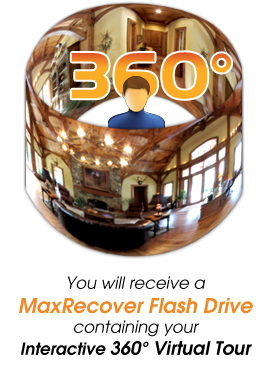 Your copy will arrive in a personalized MaxRecover Flash Drive. ● HAVE PEACE OF MIND! In case of a loss, you will not have to panic and go through the stress of having to remember everything you have… It is all documented!